Earlier this week, my latest feature – Banjo Pickin’ Girls and Fiddlin’ Women – was broadcast on Australia’s Radio National in their Earshot strand. This was a pleasure to make: the interviewees were wonderful and I loved hearing from them about the three women the piece focuses on – Cousin Emmy, Lily May Ledford, and Molly O’Day. I also much appreciated the fantastic support of my main contact in Australia – producer Gretchen Miller – who was a wonderful collaborator and has a gift for phrasing constructive criticism in a nice way. The country music of Kentucky in Southern America is rich and diverse and comes out of a bedrock of music practice, which traditionally did not include women, at least not outside the home. But there were some women who became early heroines of country music—who battled the odds to make a name for themselves in the first part of last century. Their names alone are evocative—Cousin Emmy, Lily May Ledford and Molly O’Day. After a trip to the Southern Appalachian Mountains, the strong cultural traditions of the region were so fascinating to UK folklorist and radio producer Rachel Hopkin, she decided to relocate. She spent a couple of years living in rural Kentucky, where she explored everything from basket making to barbecue, country stores to hippy communes. In the process, she was drawn into the state’s musical heritage. 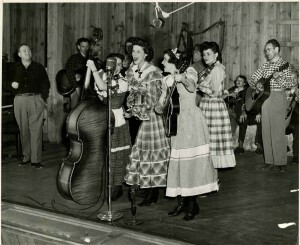 In today’s feature she talks with several local historians and musicians, and a young artist too, all similarly inspired by the early ‘banjo pickin girls and fiddling women of Kentucky’.